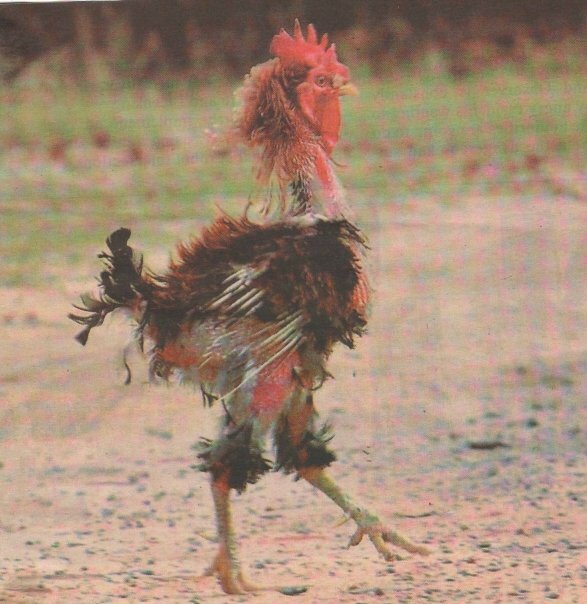 A while back I got an email from my sister-in-law that had this picture and I thought to myself, "Self, I'm feeling a little like that chicken/hen/rooster/whatever it is". Actually, I'm even starting to look like that....whatever it is. Me, with my cankles. And I've gotten behind on, well, on everything. I've slacked on commenting on blogs and my house looks like a hazmat zone. Rooms need to be painted, carpet needs to be torn out, walls need to be repaired and floors need to be found. And I need a nap. Our house has been in some state of construction/remodel since 2003. It's starting to wear on me a bit. Poor Lolly said that the house feels weird and doesn't feel like home anymore since things are so crazy around here. We're used to a certain level of crazy so you know it has to be bad if the kids are complaining. So, clearly, I need to do something about this here situation so that our house can feel like a home. But it'll get better soon. Right? And when it does, you can bet I'll be posting pictures. You will make it awesome. Dood... I saw a grossy chicken like that a Thanksgiving Point last time I was there. I took many pictures and mocked the little chicken. Your house will be amazing. Since you are amazing! PS I think your house is getting better and better. There is light at the end of the tunnel.